Henry has found it tough going in the Monaco hotseat so far. Henry has endured a difficult start at Monaco. 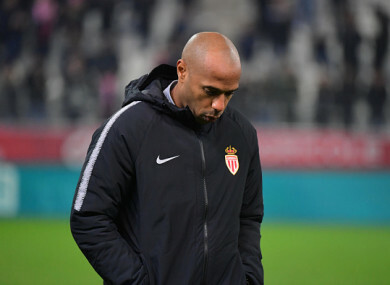 THIERRY HENRY IS still waiting for his first win since taking charge at Monaco after his team fell to a seventh league defeat of the season in a 1-0 loss at Reims. A cool finish on 24 minutes from Mathieu Cafaro gave Reims all three points and left Henry without a victory in four matches following his appointment as Monaco coach. Both sides finished with 10 men as Alaixys Romao was shown a straight red card for a high challenge on Youssef Ait Bennasser, while Monaco saw Guinea-Bissau international Pele sent off for two bookings in the second half. Monaco, who won the French title in 2017, remain second from bottom after an alarming run that has yielded just one win in all competitions this season. They will drop to the foot of the table if Guingamp, unbeaten in their past five league outings, avoid defeat at Nantes on Sunday. Henry will have one final chance to revive Monaco’s flagging Champions League campaign on Tuesday when they host Club Brugge at the Stade Louis II. Lyon captain Nabil Fekir started on his return from a month out with an ankle injury in a 1-1 draw at home to Bordeaux. Houssem Aouar volleyed in a right-wing cross from Fekir to give Lyon the lead on the stroke of half-time, but Bordeaux earned a point following a 73rd-minute equaliser by Danish striker Andreas Cornelius. Nimes snapped a nine-game winless run with a 4-0 rout of Dijon, while Patrick Vieira Nice’s beat Amiens 1-0 after an own goal by Prince-Desir Gouano. Strasbourg made it five matches without defeat following a 1-1 draw at home to Toulouse, and Senegal winger Ismaila Sarr scored for Rennes in a 2-1 win at Caen. Montpellier could go second if they beat Marseille on Sunday, after Paris Saint-Germain marched 11 points clear following their 2-1 victory over nearest challengers Lille. Kylian Mbappe and Neymar scored late goals at the Parc des Princes on Friday as the French champions extended their perfect start to the season with a 12th consecutive win in Ligue 1. Email “Henry still winless as struggling Monaco lose again at Reims”. Feedback on “Henry still winless as struggling Monaco lose again at Reims”.